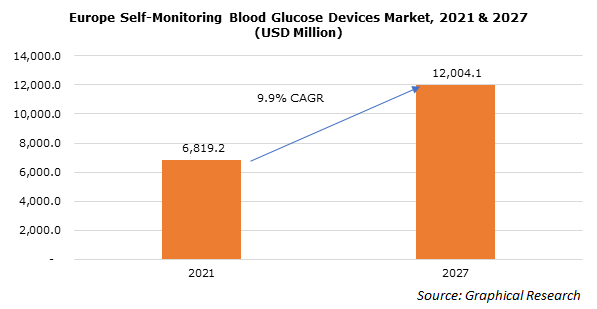 Europe self-monitoring blood glucose (SMBG) devices market size was valued at USD 4.7 billion in 2017 and is expected to witness growth of more than 4.9% CAGR from 2018 to 2024. Rising prevalence of diabetes in Europe is the key factor that will drive Europe self-monitoring blood glucose devices market during the forecast period. According to the Diabetes Atlas of International Diabetes Federation, more than 58 million people in Europe had diabetes in 2017 and the number is projected to reach 67 million by 2045. Growing geriatric population base and rising prevalence of obesity leading to type II diabetes will stimulate the market growth. Development of technologically advanced SMBG devices that offer portability, high accuracy and improved reliability will serve to be a positive impact rendering factor for market growth. Growing demand for less invasive disease monitoring devices will increase demand for such advanced SMBG devices. Investments in R&D resulting in new product launch as well as rising awareness about diabetes care and management will drive industry growth during the forthcoming years. However, high cost associated with SMBG devices and accessories may hinder the market growth. Furthermore, lack of reimbursement and stringent regulations pertaining to SMBG devices should impede the business growth over the analysis timeframe. Continuous glucose monitors (CGM) segment will show a significant CAGR of 5.6% during the forecast period owing to its benefits over traditionally available glucose meters. The CGM devices are widely used in patients that require continuous or frequent monitoring of blood glucose. CGM provides blood glucose readings every 5 minutes or in real-time. High adoption of such devices will foster the segmental growth. Hospitals segment accounted for USD 2.2 billion revenue in 2017 and is estimated to show considerable growth during the analysis period. Management of abnormal glucose levels in ICU patients is of prime importance in hospital setting. Increasing adoption of advanced blood glucose monitors to ensure safe and efficacious glucose control in hospitalized patients will augment the use of SMBG devices in hospital settings thereby driving the segmental growth. Germany self-monitoring blood glucose devices market accounted for 18.3% market share in 2017 and is anticipated to witness significant growth over the forecast timeframe. The growth is attributable to the increasing geriatric population base in the region. Technological development in SMBG devices, availability of well-developed healthcare facilities as well as increasing healthcare expenditure will augment industry growth in Germany. Some of the dominant industry players operating in Europe self-monitoring blood glucose devices market are Abbott Laboratories, All Medicus, Arkray, B. Braun Melsungen AG, Bayer Healthcare, Bionime Corporation, Dexcom, F. Hoffmann-La Roche, Johnson & Johnson, LifeScan, Medtronic, Nipro Diagnostics, Nova Biomedical, Sinocare and Trividia Health. Industry players are primarily focusing on new product launch as well as strategic mergers and acquisitions to gain significant market position and broaden product as well as customer portfolio in the self-monitoring blood glucose devices industry. Diabetes diagnostics market has been in mature stage from many years in developed economies. However, increasing prevalence of diabetes has sustained growth and adoption rate of SMBG devices. Industry players are majorly focusing on developing technologically advanced SMBG devices to fulfil growing consumer demand for home healthcare based user-friendly blood glucose monitoring devices to sustain in highly competitive market and gain significant market share. Key market players are undertaking various organic and inorganic growth strategies such as partnerships, merger and acquisition to sustain their position in the market.